About 15 years ago, I was spending a lot of my comics reading trying to become better versed in the Marvel Universe. Particularly the early 1960s material. I'd gotten a pretty good handle on the early days of the Fantastic Four, Spider-Man, the Avengers, and the X-Men, so I turned my attention to Dr. Strange. 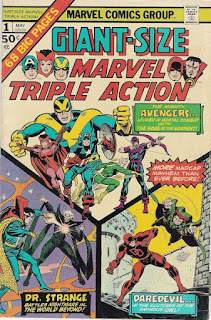 The previous ones weren't too bad because, while I couldn't afford the originals in many cases, they were all popular enough to warrant a variety of reprints, most notably the Marvel Masterworks. Dr. Strange wasn't as popular, though. He had only one of the last of the original Masterworks volumes devoted to him, and it quickly proved difficult to find even a few short years after its publication, with available copies fetching fairly high prices. I ended up spending a lot of time tracking down a weird mish-mash of titles (Doctor Strange Classics, Marvel Tales, Giant-Size Marvel Triple Action, later issues of Strange Tales...) trying to complete his story. Now, of course, it's much easier. The Masterworks line was revived in both hardcover and paperback, with a total of six Dr. Strange volumes. There've been four volumes of The Essential Doctor Strange. Not to mention that many are available digitally. And that's Dr. Strange, who's never been a particularly big seller for Marvel. Much has been written already about how this cornucopia of reprint material has made it much more difficult to sell individual back issues. The market for them is pretty much just collectors looking for the original artifacts now, as opposed to readers who want the stories. (Which the publishers, by the way, don't care about. They make absolutely nothing off back issues sales, whereas issuing a new reprint of the same material will bring revenue back to them.) What I'm wondering about, though, is the after-market sales of these reprints. Like I said earlier, that Dr. Strange Masterworks book was hard to find and pricey when I did find it. But I can go to Amazon right now, and order a 2015-printed copy for less than $40. The 2008-printing of Essential Doctor Strange is less than $25. I can still track down older copies, but unless I was a collector on the hunt for that particular edition, why would I? The implication of that is that comic shops, the ones who have largely dropped their back issue stock in favor of selling trade paperbacks and hardcovers, are even less like used book stores than they used to be and more like a niche contemporary bookstore. By that I mean that customers aren't going to browse their stock of books hoping to find an old Masterworks that has never been re-priced; they're going to browse a curated selection of contemporary books published within the past couple of years at most. I just read a piece where a retailer noted that any pamphlet book that doesn't sell in ten days is like spoiled milk and effectively unsellable. I'm suggesting that the TPB and HC aspects of their ordering isn't much different, perhaps having a shelf life a little longer than ten days but probably not more than a month. With some exceptions like Understanding Comics and Watchmen that are perennial sellers, a reprint collection isn't worth much after its initial publication because another edition will likely be coming around soon anyway. Comic shops used to be operated not unlike a library, with the goal being one of maintaining a deep selection of material. I wonder now if they're more akin to a simple mailstop -- just central location for people to pick up what's passing through. There have always been huge challenges in running a comic shop, but as I'm reflecting on it, I think they've shifted even more radically than I had been thinking before. I've been making the argument for several years now that a shop almost needs to become a destination in and of itself in order to stay solvent. It can't be just a place to pick up comics or discover new ones; it has to be a place to be, where you hang out and become part of a community. In light of my thinking above, I think that notion of a comic shop needing to be the primary reason someone goes there (with picking up comics being a secondary consideration) is more imperative than ever.